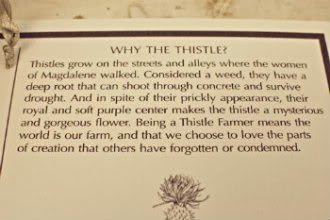 My last post was about Madalene House and Thistle Farms. In this post I get to combine several of my favorite things – which includes Thistle Farms products, Christmas, P Allen Smith, and the Berry Family of Nurseries. 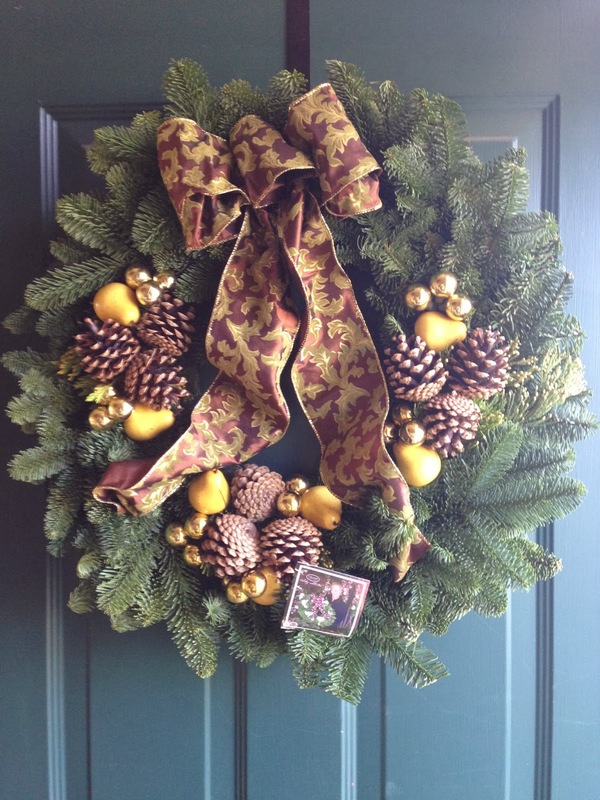 Last week I received this beautiful wreath from the Berry Family of Nurseries’ Holiday collection from P Allen Smith. It was sent to me with the challenge of decorating it in a way that would bring to light one of my favorite charitable organizations. P Allen Smith will then post it on his Pinterest Page – if my post gets the most response from Allen’s page, then my organization will get a set of fresh greenery sent to them by the Berry Family! So here’s my dilemma – It is perfect on my front door and I love it JUST THE WAY IT WAS SENT TO ME. But I want folks to know about Thistle Farms and the Madalene House. Well, as it so happens I also am having some friends over soon for a little Christmas gathering. I had been trying to think of a fun way to hand out my little Christmas surprises that I had gotten for my friends – all goodies that I had purchased from Thistle Farms to support their organization, help my friends learn about their great products, and to just let my friends know I love ’em. “Founded in 1997 by Becca Stevens, an Episcopal priest on Vanderbilt’s campus, Magdalene is a residential program for women who have survived lives of prostitution, trafficking, addiction and life on the streets. Thistle Farms is our social enterprise. The women of Magdalene/Thistle Farms range in age from 20-50, and many have been sexually abused between the ages of 7-11, began using alcohol or drugs by 13, have been arrested on average a hundred times, or have spent about 12 years on the street prostituting. We furnish housing for 30 residents and graduates and provide outreach services to women still living on the streets. New residents are given a key and are offered the necessary resources to maintain recovery, heal from childhood wounds, become physically healthy and find employment. After four months, the women find work, return to school and/or enter Magdalene’s job training program at Thistle Farms, a social enterprise. Magdalene also offers a matched savings program to help residents prepare for economic independence upon graduation. Women who remain in recovery two years post-graduation are eligible for a new home buying program administered by two local congregations and Magdalene. Magdalene’s programs are grounded in its 24 spiritual principles that advocate living gracefully in community with one another. Residents, graduates, staff and volunteers share daily tasks, offer hospitality, build on each other’s strengths, and provide compassionate, disciplined support. Magdalene was founded not only to help a subculture of women, but also to help transform the culture itself. We stand in solidarity with women who are recovering from abuse, trafficking, addiction, and life on the streets, and who have paid dearly for a culture that continues to buy and sell women. I decided to use the wreath as a centerpiece on my coffee table and decorate it with the different Thistle Farms products. As I pulled out my teacups for the party, I put a small sticky dot on the bottom of the cups with a number (from 1- 20). After we visit and enjoy catching up, I’ll have the gals check the bottom of their teacups. Number 1 gets to choose first from the wreath and we’ll go from there. Cards made from real flowers, lotions and lip balm, and a travel survival kit. Thank-you, P Allen Smith and Berry Family of Nurseries for this opportunity to get the word out about this organization that is changing my outlook on life as it dramatically changes the lives of so many other women. My buddy, P Allen Smith, has teamed up with the Berry Family of Nurseries to create some wonderfully enhanced and delightfully fresh greenery that comes ready to hang or set on your table or mantle.